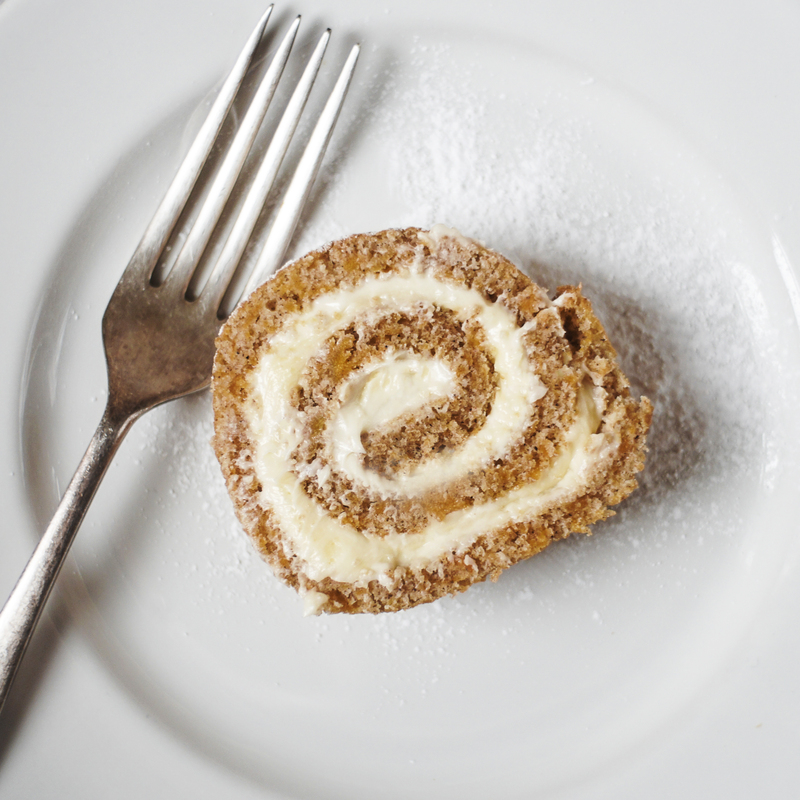 Pumpkin Swiss Roll with cream cheese frosting using butternut squash! I’ve said it once and I’ll say it again, we brits don’t eat enough pumpkin. Its September and I can’t find anything that even resembles an edible pumpkin. Not even canned puree, the only place I can find it is on Amazon and I’m not playing anymore, I’m over this. So this weekend I’m starting to get all of my autumn bakes prepped out and I want to stock up on winter baking essentials and pumpkins are nowhere to be found, I can’t even seem to find the frozen pumpkin chunks I used to rely on. So whats a girl to do? Two words … Butternut squash. Lets face it butternut squash is the less potent cousin of the pumpkin and when I lived in Australia they didn’t even use the word squash, they were all just different kinds of pumpkin. So I did a bit of experimenting, and maybe this wasn’t the best recipe to try out a new ingredient, Swiss rolls can be hard, they don’t rise, they rise too much, too dry and they won’t roll and start to crack, too moist and they stick to the towel when you roll them up. 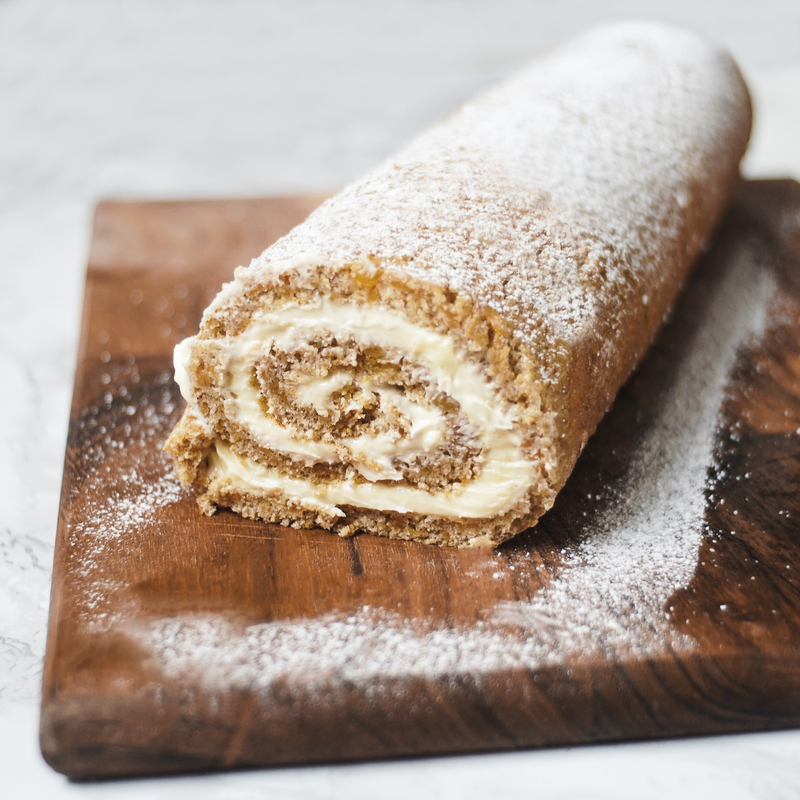 But with a stroke of genius I managed to make a perfectly rolled, didn’t bloody crack at all moist pumpkin Swiss roll, using frozen butternut squash. And I was over the bloody moon with it. Of course tinned pumpkin is a lot deeper in colour so if your after that rich orange colour you may have to add a drop of food colouring. I recommend buying frozen butternut squash chunks. You can buy fresh if you want but it much more of a hassle to peel and chop. Just boil the squash until soft and throw them in a blender until smooth. Honestly once you have all the pumpkin spices in there and the frosting I 100% would not be able to tell the difference. Preheat oven to 190C / 375F. Grease a large shallow baking tray; line with baking paper. I actually just used my grill pan. Grease and flour the paper too. Lightly dust a thin, cotton kitchen towel with the 4 tablespoons of icing sugar. Add your butternut squash chunks to a pan of boiling water. Boil over a high heat for 20min or until soft. Strain and add to a blender with the 10ml of water and blender until smooth. Leave in the fridge to cool whilst you prepare the cake batter. In a small bowl combine the flour, baking powder, bicarbonate of soda, spices and salt, stir to combine and set aside. Beat together eggs and sugar in large mixing bowl. Beat in butternut squash then fold in your flour mixture. Transfer the mix to your baking pan. Bake for 13-15min or until top of cake springs back when lightly touched. Immediately turn cake onto you sugared towel. Carefully remove the baking paper. Starting with on of the narrow ends, carefully roll up the cake and the towel together. Leave to one side until completely cooled. 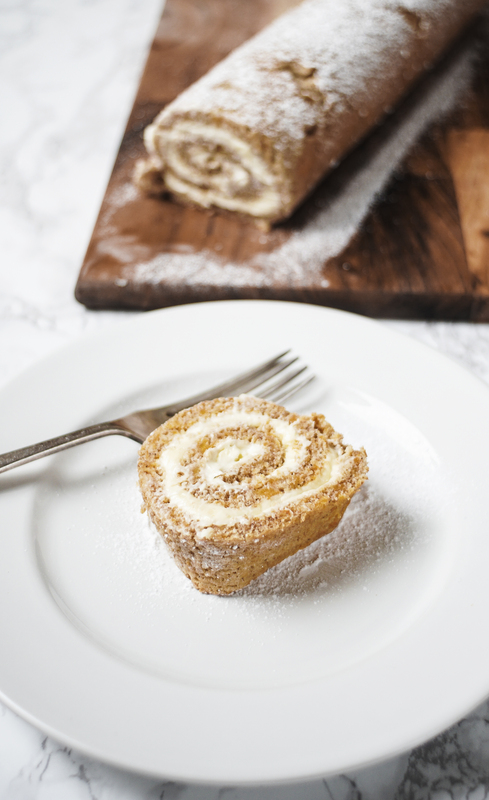 Carefully unroll your cake and take away the towel. Spread your frosting evenly over the cake and re roll. 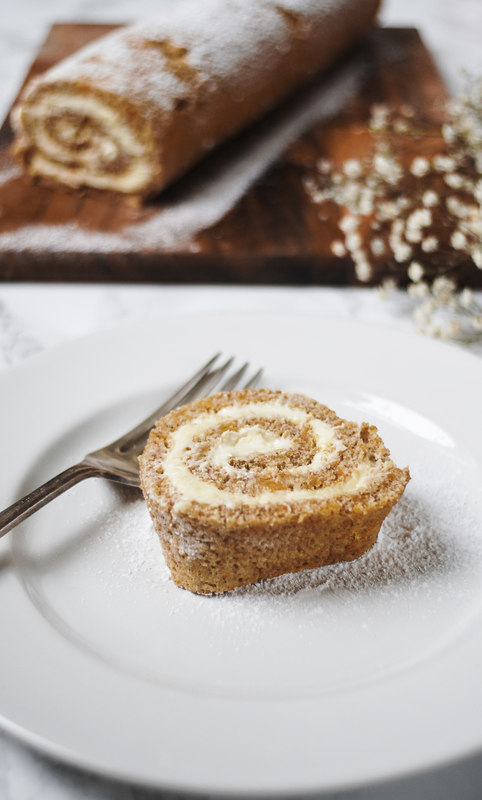 Leave in the fridge for at least an hour to set the frosting a little before you serve and give the whole log a light dusting of icing sugar just before you serve. And there you have it, if you give this a try with butternut squash let me know how it goes by tagging @whatseatingmanchester in your social media post.